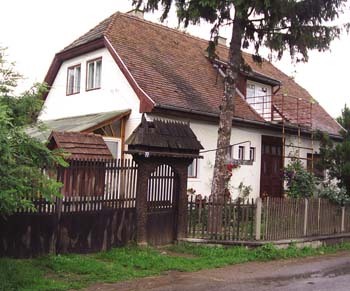 Old country house, with traditional painted furniture, situated in the margin of the village. The owner is a mushroom expert. For guests there are six rooms. It is also possible for a group of maximum 17 people to rent the whole guesthouse. In the garden it is possible to put up a tent and there is place for a campfire. The cuisine of the guesthouse is a traditional one. Here you can try a large variety of mushroom based meals. They also serve traditional Hungarian alcoholic drinks, such as palinka (brandy) and all sorts of vines. You can also participate in guided mushroom tours. There is an interesting fact of the pansion’s cellar: sometimes it is like a spa where the sulfuric gas brakes to the surface. This gas is known to cure several illnesses. The surroundings has everything to offer for a nice holiday in nature: you can make lovely walks and bicycle tours, not far there is a lake for swimming and fishing and you can ride a horse.